In the Mood…For Some Big Band Swing! No music is more special that Big Band and the Swing Era- “The Music That Won The War!” Bluff City Theater is proud to present this recreation of a concert just as you might have heard it at the end of WWII. This special one-night presentation features one of America’s premiere ensembles dedicated to the Big Band and Swing eras- The St. Louis Big Band. 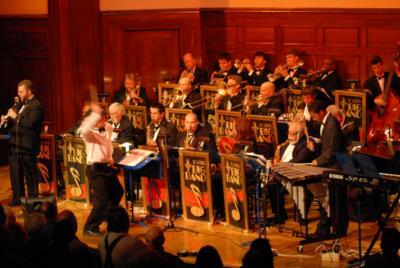 Regular performers at Casa Loma and around the midwest, The St. Louis Big Band will charm and delight you with their faithful renditions of many of your favorites including Benny Goodman, Tommy Dorsey, Glenn Miller, Duke Ellington and many more! And if you like to dance, we’ve reserved the orchestra pit just for you. So come out for the experience of a lifetime-right here in Hannibal! Reserve your seats today by calling the box office at 573-719-3226 or online here. Bluff City Theater is a 501C-3 professional theater company dedicated to enhancing the quality of life for residents and visitors through the performing arts. Next article The Big Band Concert of 1945!